This overlooks the fact that ‘the majority of petroleum is converted to petroleum products, which includes several classes of fuels’. It also includes ‘conventional fertilizers [which] are commonly derived from petroleum. In fact, a single 40-pound bag contains the equivalent of 2.5 gallons of gasoline.’ Electricity is only a manufactured power source, as far as national networks are concerned. Electricity is “the new oil” and the effect of increasing global electrification is having a “very deep rippling effect for the power sector”. That was one of the highlights this morning at the launch of the International Energy Agency’s annual World Energy Outlook, reports PEI. She said this “leads us to improved prospects for affordability, with cheaper energy sources available throughout the energy sector”. Cozzi said that in the move towards a world that is increasingly electrified, China and India were key players. To try to put some perspective on the scale of electricity growth in Asia, Cozzi said that in the next five years “India is going to add one European Union to its electricity sector – China is adding one United States”. “India is going to add one European Union to its electricity sector – China is adding one United States”. And where does she think this electricity will come from – moonbeams? Paul, I assume they have taken into account the number of coal fired power stations that both India and China are in the process of building. The other thing is they may be considering the EUs reliance on unreliables which lowers the amount of electricity available. It would have been the same for the US if Clinton had become president. Never underestimate IEA geniuses. Soon they will start drilling for electricity. It will gush out of the hole and skeptics will look absolutely stupid. From 2006: Oil drillers have struck dinosaur off Norway, the Research Council of Norway announced this week. Found 1.4 miles (2.3 kilometers) beneath the North Sea, the fossil find marks the world’s deepest known dinosaur, researchers say. From 2012: Exxon Neftegas Ltd (ENL) has completed drilling the world’s deepest well in the Chayvo oil field on the Sakhalin shelf in the Russian Far East. The shaft of well Z-44 is 12,376 meters deep, which is the equivalent to 15 times the height of the world tallest skyscraper the Burj Khalifa in Dubai. That’s over five times the depth of the deepest dinosaur fossil. Huh? Name one ‘green’ alternative that’s more ‘affordable’ than fuels. First the Ecoloons launched a campaign to make Nuclear Power too expensive by legal and political means…..Check. Then they Road Blocked Hydro…….Check. Next their sights were on Coal………….Check. 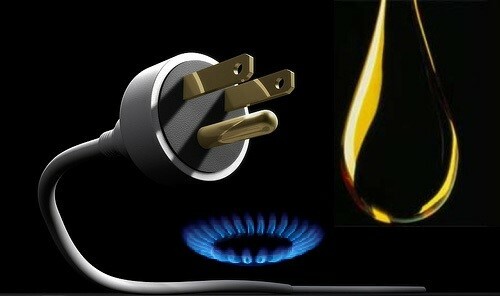 Natural Gas is next on their list…..
Their real object is to enslave and pauperize Humanity. They really are crazy? or we the crazy ones for allowing them credibility? Poor enslaved people destroy their environment, so the Ecoloons are not really saving the environment. Germany with no nuclear AND no coal wouldn’t work, basically.